It was a massive year for comedy news in 2014 with news both good and bad– gigantic shifts in the Late Night arena, tremendous heartbreaking losses of great comedic voices, the dismantling of a legend, and the year that the making of a comedy movie had international political repercussions. There so were many ups and downs for those who make us all laugh in 2014, if felt as if everyday the major media of the world had comedy news on their front pages. 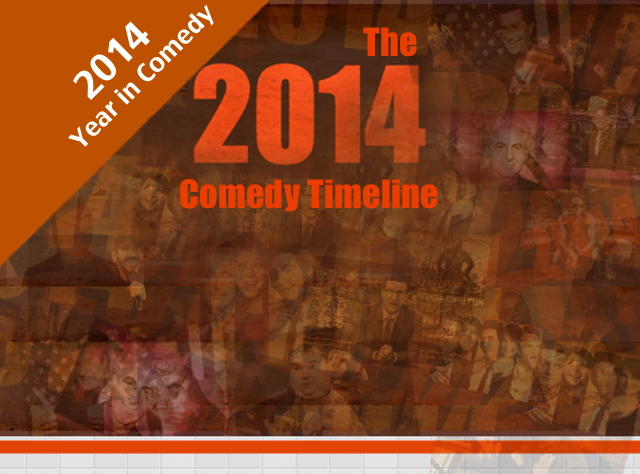 We put together a timeline to highlight the momentous news moments the comedy world shared this year. Here’s to a great 2014, despite the tremendous loss and sadness and here’s to those who will create a memorable 2015. Cheers!